I'm a fan of Deb Perelman's blog, Smitten Kitchen. It's actually one of the few blogs I still read regularly; she writes in an entertaining manner, and her recipes are uniformly successful. Because I knew the recipes would be solid, I made sure to get a copy of her cookbook and read it from cover to cover. Several recipes jumped out at me, screaming, "make me! make me!" One of those was this salad of farro with carrots, parsnips, feta, and mint, all bathed in a dressing of lemon juice, harissa, and honey. And there you have the recipe. It's really simple and really good. 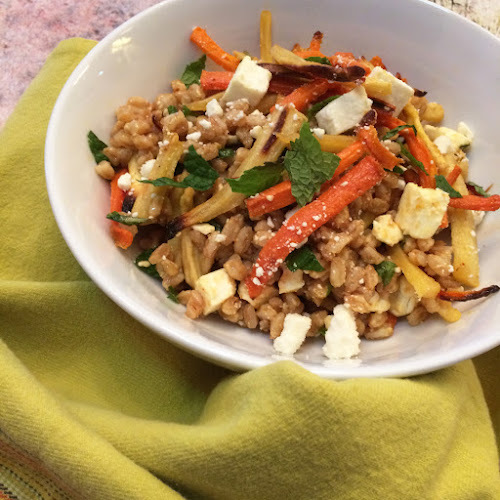 The farro is pleasantly chewy, the root vegetables are sweet, the mint aromatic, and the dressing and cheese really liven up the dish. I think this will become a warm-weather staple in my house, once I can figure out how to cook the root veg without turning on the oven. Perhaps pan sauteeing over high heat, maybe charring the veg first over a gas burner. I'm just going to paraphrase the recipe here, telling you what I did. If you want the exact recipe, you'll just have to buy the book! Seems like a lot of veg, but they shrink down to nothing. Toss the veg with olive oil and salt and spread out onto two foil-lined baking sheets. Roast 20 minutes at 400°F, stir, then roast an additional 10 minutes. Set aside to cool to room temperature. Add farro to 2 1/4 cups water or stock with a big pinch of salt and bring to a boil. Turn down to a simmer and cover pot. Cook 35 minutes, or until tender and fluffy. (I used Wegman's brand farro and it was done in about 25 minutes. YMMV.) Cover pot and let sit for 10 mins or so to allow farro to absorb remaining water (I poured it out.) Fluff with a fork. Make a dressing with 3 tablespoons fresh lemon juice, 5 tablespoons extra virgin olive oil, a big pinch of cumin, 2 teaspoons of honey, and harissa to taste. (I have dried harissa powder in a jar and it's very mild so I used 2 teaspoons. Other brands will be uber hot, so use judiciously.) Season with salt and set aside. Have more lemon ready, in case you need more oompfh. Toss the cooked farro with the dressing and add the veg. Toss again. Add a big handful of crumbled feta cheese and another handful of chopped fresh mint. Stir and taste for seasoning. You might need more salt and or lemon juice, as I did. I served the salad with boneless skinless chicken thighs that I had marinated in a combo of salt, harissa, cumin, and olive oil (pinches of each for 3 thighs). Browned on both sides in a bit of olive oil, then turned down the heat and cooked until done, about 20 minutes total.